Revolution Brewing has recently invaded Massachusetts and they have been welcomed with open arms. I recently stocked up on several of their offerings and must say that they will be in my regular rotation for the foreseeable future This bad boy is part of their "Hero Series" that showcases specific hop varieties and as you can see, we are going back to the recently popular Mosaic hop. I think the past year has seen almost every brewery in the U.S. blow a load for Mosaic, but only some can make the most of it. Good luck, Revolution! Pours a slightly hazy, but mostly transparent glowing orange with two fingers of white head. The aroma has big pine and tree bark with pineapple and it's sweet like honey. Some really nice hop oils and resin hit the front of my tongue immediately and they linger for a long time which is great. Not as much pineapple from the aroma, but instead it is a candied orange and even clementine. After the fruit juices subside, pine greets me with a kick to the face as sap and spruce bring almost a Christmas tree feel to the taste. The finish is actually quite bitter with lingering dankness and hop oils. Mouthfeel is perfect at 7.0% as it is full-bodied with perfect carbonation and no alcohol presence. Some of the heavier sap and dank notes might rub some people the wrong way, but I like it and find this to be fully flavored and easy to drink. 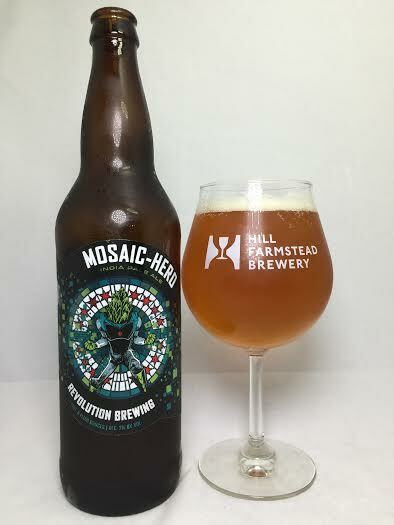 Mosaic-Hero succeeded at highlighting the ever-so-loved Mosaic hop with notes of tropical fruit and pine. It is incredibly drinker-friendly and contains an array of characteristics that will satisfy anyone who comes across it. If only it wasn't a one-time thing :(.